Altogether, since 2007 the kingdom has spent roughly $20 million lobbying policymakers and soliciting sympathetic coverage from journalists in the United States on all issues, including Western Sahara. In 2009, it lobbied members of Congress, the executive branch and journalists more than any other Arab country -- more than twice as much as Egypt, according to the Sunlight Foundation, a Washington-based nonprofit that advocates for government accountability and transparency. In another article on Morocco's lobby efforts in the U.S. entitled, derisively, "The Arab Exception", Ahmed Benchemsi attributes the U.S. tolerance of Morocco's authoritarianism to strategic irrelevance and relativism among U.S. foreign policy circles. Quoting a conversation with a US foreign policy expert, Benchemsi writes: "Still, the main reason behind U.S. tolerance for Morocco’s serious shortcomings might be more cynical—and more painful for the kingdom to accept. As a U.S. foreign policy specialist put it to me bluntly: “Morocco benefits from a combination of relativism—whatever happens there is less tragic than the Mideast’s bloody ordeals—and irrelevance. Since there is no real interest at stake, there is no reason to scratch under Morocco’s surface.” Who has time for that in D.C. anyway?" 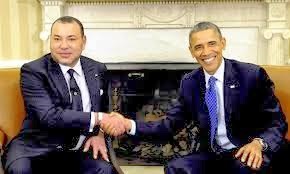 The latest attention to Morocco’s lobbying efforts in the US are not, on face value, nefarious because various foreign countries are in constant competition to cajole US affections. For every lobbying attempt by Morocco, Algeria, and the POLISARIO, no matter how modest in comparison to Morocco's, are courting their own machines of pressure in the US and Europe. According to a 2011 report by the nonpartisan Sunlight Foundation, Morocco is the leading Arab country in lobbying operations in the US with 653 contacts, followed by the U.A.E (407 contacts), and Egypt (306 contacts). Morocco's regional foe and other shadow party to the Western Sahara conflict, Algeria. had only 50 contacts. Despite all of the exorbitant sums of money spent on lobbying, Morocco's political lobbying proxies are actually under performing, amidst a marked international shift towards the right of self-determination of Sahrawi people in the region. Such shift is the result of tremendous pressure group activity on Capitol Hill, accentuated by the high profile lobbying efforts, for instance, of Hollywood's own Javier Bardem and the congressional screening he organized for his documentary: "Sons of the Clouds: The Last Colony", which documents plight of Sahrawi people in the territory. Similarly, Morocco's lobbyists couldn't prevent the Kennedy Center for Justice and Human Rights from publishing a scathing report on the status of human rights and Moroccan violations of individual freedoms in the Western Sahara. Morocco's attempt to court friendly attention in Washingtonm, D.C., while financially costly, is not as successful as the Foreign Policy article contends. Nor are they the greatest impediment to democratic progress in the Kingdom as Benchemsi contends. Far from excusing Morocco’s authoritarian system and the fortification of the autocratic state in the kingdom, lobbying is only an epiphenomenal factor in the explanation. Morocco’s edifice of authoritarianism is located more in domestic variables of state manipulation, limited cosmetic reforms that amount to nothing but discursive attempts to pacify societal angst, and the distribution of patronage among state and society elite.those are more proximate causes for the current state of authoritarianism in the kingdom, even in the aftermath of the Arab uprisings, fledgling protest movements, and a new watered-down constitution.